House and Senate GOP leaders are encountering increasingly stiff political headwinds in their drive to repeal the Affordable Care by the end of the month, as influential Republicans in both chambers press to delay final action until President-elect Donald Trump and party leaders can reach a consensus on a workable replacement plan. House Speaker Paul Ryan of Wisconsin and Senate Majority Leader Mitch McConnell of Kentucky have been adamant that the two chambers forge ahead with floor votes and committee work that would culminate in a final vote by the end of January or early February – regardless of whether the Republicans and Trump are able to cobble together a replacement plan at the same time. But some prominent Republican senators and a substantial faction of House GOP conservatives are balking at the leadership’s hasty action, a sudden development that could sidetrack the leadership’s ambitious plans to dismember Obamacare. Some Republican lawmakers fear that in their rush to make good on a campaign pledge to repeal Obamacare, Trump, and the GOP leadership might end up triggering a chaotic situation in which tens of millions of Americans lose their coverage in the coming year or two while major insurers and hospitals incur huge financial losses as the Obamacare markets crumble. Trump on Tuesday stepped up pressure on Republicans to move ahead with a repeal of Obamacare and then adopt a replacement shortly thereafter. “We have to get to business,” Trump said. “Obamacare has been a catastrophic event. His latest declaration on the subject clearly undercut those in his party who say it could take many months or even years before a full-blown replacement program can be agreed upon and phased in. Even the most optimistic of Republicans, including Ryan, have indicated it could take until the end of the year to strike an agreement on a major health insurance bill to replace Obamacare. Republicans hold a relatively narrow 52 to 48 seat majority in the Senate. Because of the special budget reconciliation rules that are being used, the leadership needs only a simple majority of 51 votes to pass the budget resolution, instead of the usual 60-vote supermajority. But if the leadership suffers the defection of just three Republicans, the Obamacare repeal effort could collapse. Trump and the Republicans rode to victory in the 2016 election blithely promising to repeal and replace Obamacare as one of their first acts. Now, in the harsh light of day, the GOP victors are struggling to figure out how to make good on that promise without prompting a voter backlash from millions of Americans who could lose their current subsidized insurance or extended Medicaid under the Affordable Care Act. 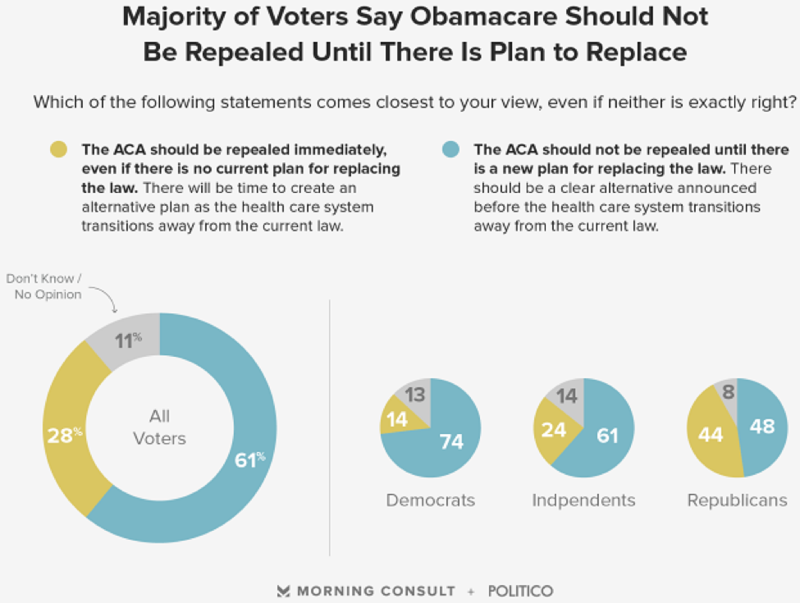 Underscoring that dilemma for the GOP, a new Morning Consult/Politico poll released Tuesday found that nearly two-thirds of voters say the Republican-controlled Congress should not repeal Obamacare without having a replacement plan in hand. While Republicans typically have voiced much stronger feelings than Democrats for the need to dismantle Obamacare in short order, the new poll found that 48 percent of Republicans and 61 percent of independents said there should be a “clear alternative announced” before repealing the 2010 health care law. A Gallup poll conducted shortly after Trump’s surprising November 8 victory over Democrat Hillary Clinton found that while more than half of Americans were dissatisfied with Obamacare, 57 percent said they either wanted to keep the law as is or wanted to keep it and change the law significantly. Little more than a third said they wanted to repeal and replace it as the Republicans have vowed to do. The Senate is scheduled to take the lead with a vote on Thursday to formally launch the budget “reconciliation” process and put repeal of Obamacare on a fast track by ordering the Finance Committee and Health, Education and Labor Committees to report back with final repeal language by Jan. 27. The House appears set to vote on a similar budget resolution Friday that instructs the Ways and Means and Energy and Commerce Committees to draft language and report back by Jan. 27. The House vote originally was scheduled for next week, but it’s possible the leadership decided to move up the vote before any internal party resistance began to gel. Once the GOP leadership resolved differences in the two resolutions, the House and Senate would then vote on the final resolution targeting key elements of Obamacare for elimination, including premium subsidies, taxes and mandates on individuals and businesses. However, five GOP senators – Corker, Rob Portman of Ohio, Susan Collins of Maine, Bill Cassidy of Louisiana and Lisa Murkowski of Alaska – offered an amendment on Monday that would extend the target date for House and Senate committees to complete work on the final wording of the resolution to March 3, according to media reports. Corker said that since Trump stated shortly after the election that repeal and replacement of Obamacare should take place simultaneously, the amendment would provide the incoming administration with more time to outline its priorities. Meanwhile, Paul, the Kentucky libertarian who unsuccessfully challenged Trump for the GOP presidential nomination, has thrust himself into the debate by calling for a delay in repealing the law until Trump and the Republicans can cobble together a replacement plan acceptable to a majority of Republicans. Paul said that he and Trump were in contact last Friday and that Trump is open to considering a replacement plan that Paul is working on. Trump, Ryan, Rep. Tom Price of Georgia, and other Republicans have floated various proposals for a new, more market-based approach to health care coverage, but none of them has gained traction yet. In the House, meanwhile, members of the arch-conservative Freedom Caucus met Monday night to confer on possibly seeking a delay in acting on the budget resolution. Rep. Mark Meadows (R-NC), the new chair of the caucus, told Bloomberg that his group wants to see more details about a replacement plan before voting on the budget resolution. Meadows and about a dozen other caucus members conferred with Rand Paul last week, who argued that the budget resolution not only could cause chaos in the health care system but also add substantially to the debt. "We hope they would see the prudence of waiting," Meadows said of the GOP leadership.